On the Waagplatz, near the Mozartplatz, you will find the Trakl Gedenkstätte. In this house, Georg Trakl was born in 1887 and he lived here most of his life until he turned 21. Trakl was not a good student, dropped out of school and started an apprenticeship as a pharmacy sales assistant in the Linzergasse. He studied the French Symbolism intensively and started publishing poetry at a very early age. However, he could not cope well with his life, suffered from depressions and frequently took drugs. His work is intensively connected with Salzburg and seven plates with poems by Trakl commemorate this fact. Supported by Ludwig Wittgenstein and other Viennese intellectuals, Trakl spent a lot of time in Vienna and Innsbruck. In a very short amount of time, he left a remarkable imprint on early 20th century literature as an expressionist poet. After witnessing the horrors of World War I and suffering from a nervous breakdown, he died in Krakau at the age of 27. The circumstances of Georg Trakl′s death are unclear, but it is generally assumed that his death was a suicide. Trakl′s work was translated into 26 languages and the Trakl Memorial Site was created to preserve a testimony for it. 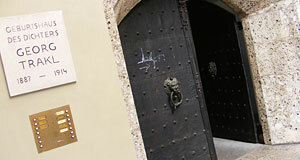 It contains manuscripts, letters and personal items of the poet and his family. It is open for the public with guided tours only.